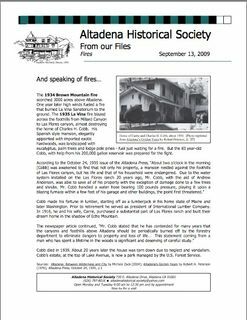 The Altadena Historical Society (of which we are members) has a great story in their Sept. newsletter on fires in 1934 and 1935, which endangered La Vina and the Cobb Estate (click to get the pdf version). BTW– the photograph of the Cobb home featured in the attachment is one of a very few that exist. If any readers have a picture of the house tucked away in their family papers, please please please let us know.